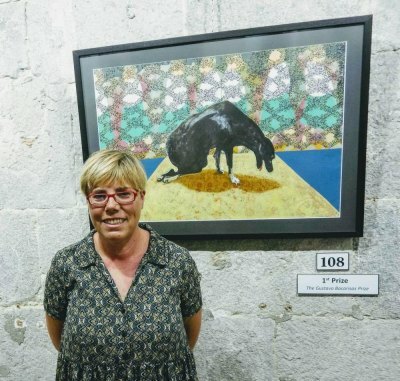 The Gibraltar International Art Exhibition, organised by the Gibraltar Cultural Services on behalf of the Ministry of Culture, is currently taking place at the Gustavo Bacarisas Gallery. 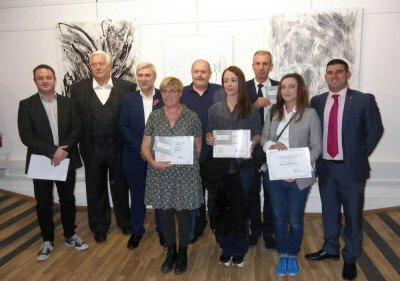 Artists from Gibraltar and Spain submitted a total of one hundred and twenty three works. The Minister for Culture, Steven Linares officially opened the Exhibition and presented the awards yesterday. Mr Brian Catling, Royal Academician, carried out the adjudication. Commenting at the Official Opening of the International Art Exhibition, Steven Linares said: “This exhibition is a unique art event in which we open our borders and welcome artworks from different countries, thus continuing to strengthen the bonds between local and international art communities. I am confident this exhibition will prove to be an inspiring and gratifying experience for all. We must give special thanks to this year’s adjudicator, Mr Brian Catling, from the Royal Academy, for undertaking this task. Thanks must also go to all the artists and the Gibraltar Culture Services staff for their continuous dedication and hard work. Without them this exhibition would not be possible. I hope that everyone will enjoy this year’s exhibition.” The Exhibition is now open to the public until Saturday 17th November 2018 between 10.30am and 6.30pm on weekdays and 10.30am to 1.30pm on Saturday. Entrance is free.